Today’s TBT recipe comes with a photo of something you DON’T do. You actually don’t roast the poblanos over an open flame. Nope, all you have to do is caramelize in a saute pan. Then you have the basics for an onion dip that will have you tossing out all those boxes of onion soup mix. Do this instead. Gee, on these warm summer nights, perhaps you don’t want a big meal. But you are hungry. And thristy. A beverage, some chips and this lovely dip. This is comfort food brought to a higher level. From the August 2012 edition of Martha Steward Living here is a recipe that Suzen and I cannot wait to share with you. To get the onion flavor, use real onions. 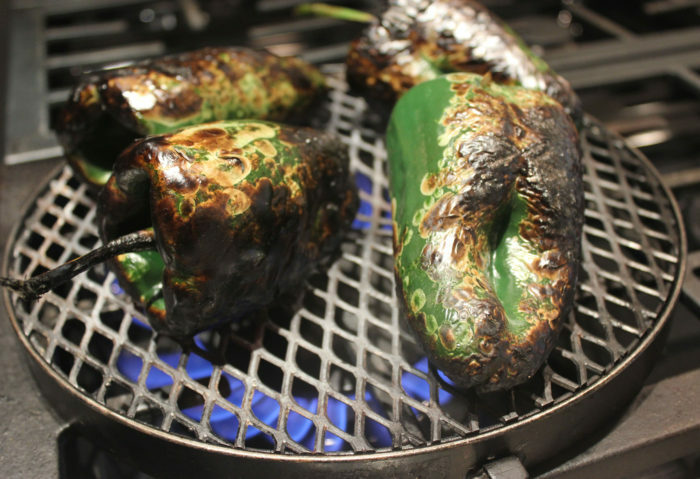 To get some heat for a different flavor profile, caramelize some poblanos. To intensify flavor, add lime juice. And to add richness, pair cream cheese with the standard sour cream. Ah, is it healthy? No, not exactly. But, is it satisfying? Yes, magnificently yes. The fact is that you can, and possibly should, eat everything. You just need to do it in moderation. Our brains tell us when “enough is enough.” The problem with processed foods, or that classic onion dip made from a bag, is that we too used to it, and the real flavors of the food are buried in salt, preservatives, and gunk. Your cravings are actually good experiences to have, and those cravings are for real food. If you crave onion dip, then this is the one you should try. Dipping things: chips, cucumber slices, radishes, baby carrots …. Stir together the lime juice, cream cheese and sour cream in a large bowl, using a rubber spatula, until smooth and evenly mixed. Add the onion mixture and stir to blend. Season with salt if necessary. Refrigerate for at least 1 hour or up to 1 day. Sprinkle with cayenne for color.